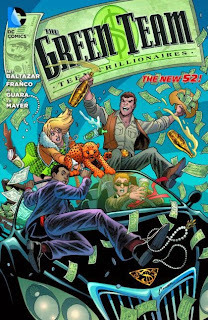 The news that DC Comics has cancelled the collection of Franco and Art Baltazar's Green Team, Teen Trillionaires marks the first New 52 ongoing series not to be collected in trade. * Previously it had seemed that every New 52 series would be collected, as evidenced by the number of cancelled series that received full collections -- Sword of Sorcery, GI Combat, and Team 7, to name a few. Still, logically we probably might have expected this wouldn't last. And, if we take DC at their word regarding cancelled trades in the past, that pre-orders just weren't there, then logically we can't expect DC to publish a book on which they'd have a reasonable expectation they'd lose money. Admittedly, I did not pre-order Green Team, Teen Trillionaires, though I fully expected to purchase and read it at some point. All the issues are available digitally, of course, and will be available perpetually, so if I still wanted to read this series, of course I could without much difficulty. For me, however, there is something eminently more satisfying about reading a trade -- in print or in digital -- than reading single issues; even if it's only switching from issue to issue on the same device, there's a mental break in the reading experience that makes it lesser for me than reading a trade. (Also a bunch of single issues messes with your digital trade shelf.) So the fact that Green Team is technically "available" doesn't move me, because it's not available in the format I want. Which leads me to wonder, why not digital trades? There would be some cost to DC involved in terms of creating a cover and some opening pages, but surely 80 to 90% of the work is already done? Maybe it's costly simply to have the collection on the financial books, but it seems to me that just because the print collection is cancelled, doesn't mean the digital collection must be also. Given the existence of the material already (even already digitized), surely there's sufficient profit to be made from readers like me to "collect" these issues even if not to print them. And then we couldn't say the book hadn't been "collected," either. Why stop with digital equivalents of print trades? Again, since considerable material is already digitized, can it really be all that much work to bring it together in one package? The long-requested Crisis on Infinite Earths tie-ins collection might be one offered digitally, or a Armageddon 2001 or Eclipso: The Darkness Within annuals collection. A digital trade doesn't even need to concern itself with page quantity, just file size, so the opportunity is there to collect more issues than in a standard trade. Seems to me "cancelled" doesn't really need to mean "cancelled" any more. UPDATE (4/22/14): Apparently a digital trade of Green Team is now available. Who knew? *Various mini-series including Justin Gray and Jimmy Palmiotti's Ray, Phantom Lady, and Human Bomb, plus the four National Comics one-shots, also haven't been collected. I don't see why there is any need for digital trades in additional to digital singles. For me, the appeal of physical trades is price, availability, convenience and storage. 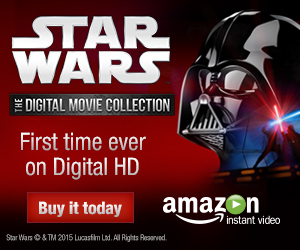 Based on these criteria, a digital trade is no different to a collection of digital singles. A bundle of issues on Comixology works exactly the same as a digital trade - you can even keep reading from one issue to the next (within a series, at least). What I would like to see with digital platforms is the ability to design your own reading order, or even to follow other users' suggested reading orders. For example I'd like to read all of Jim Starlin's cosmic Marvel work without jumping from one series to another. Or maybe Crisis on Infinite Earths with all the tie-ins intersperced at appropriate points. Or 1990s Superman following the triangle numbers. To use a more modern example, if I've bought digital issues of all of Hickman's Avengers and Infinity series, why isn't there an easy way to read them in order without rebuying them as a digital trade? Two ways of looking at it, Michael. For you, it's good enough to have a bunch of digital single issues where you can continue reading from one to the next (on Comixology, at least; I'm not sure this is true on other systems). For me, I don't want even the issue to issue break or the text box that says "Next issue ... war!" or whatnot; I like the trade format where single issues are put together like a book, and I want that even if I'm reading digital. You cite "price, availability, convenience, and storage" as the appeal to you of trades; for me, I would also add "experience" -- I like the experience of reading a trade, which is something I can't duplicate with digital single issues. I'd add that DC does a really good job with this -- their digital editions of their print trades still read just like the trade, with covers between the chapters, alternate or black and white covers, any extra material, and even a "back cover," which is a bit of an anachronism but still a nice touch in "duplicating" the print trade. Another argument for digital trades is that many trades include dialogue and artwork corrections, while digital single issues tend to keep all errors that saw print. good point about bundles, but not all titles are bundled, are they? for me, one of the reasons i like trades is because of the price, especially if buying online. My biggest concern is proper descriptions or labeling. Some publishers call a bundle of digital issues a 'trade' (which typically won't have any extras), while other companies actually have a digital trade that mirrors the physical book (which would have the extras). I've been burned a couple of times when I've bought a digital trade, and find out it's just the singles as one file. As I mentioned in an earlier reply, I can speak mainly just to DC's digital trades, but those mirror the print trades pretty exactly and include the book's extras and back cover. This is up on comixology today as a digital trade. So it is. So weird this wasn't announced anywhere.